Step 1: Assess your home to determine if there are any home improvement projects needed to enhance energy efficiency and increase comfort. How: Air seal and insulate your home to save money on heating costs this winter. The Department of Energy provides a thorough guide on where and how to insulate both new and existing/old homes. I found a helpful video on the Lowe’s website outlining where to insulate. They also had a helpful article on how to get started with weatherstripping. What We Did: We contacted several different companies about insulation and scheduled free home consultations to evaluate our needs. Since our 1928 Craftsman is brick on clay tile, we were told that there isn’t much room to add in any insulation into the walls, but we were advised to re-insulate the attic and wall joints. In the meantime, we decided to start with weatherstripping and caulking around windows and doors. We also plan on purchasing radiant barrier to put up behind our radiators to increase heat flow. Step 2: It’s already starting to get cool here in Cleveland, so we’re taking advantage of the 40-50 degree weather and working outside. If you haven’t already, take the time to finish all necessary yardwork before the first freeze to ensure a colorful spring. How: Prepare your lawn and garden for the winter by cutting back perennials and raking fallen leaves. Cover outdoor planters with large garbage bags and seal with duct tape or rope. Remove cushions from your outdoor furniture and store them in weatherproof bags; cover any furniture that will remain outdoors. A quick Google search resulted in this video (and other similar videos on winterizing your home and garden) at eHow. 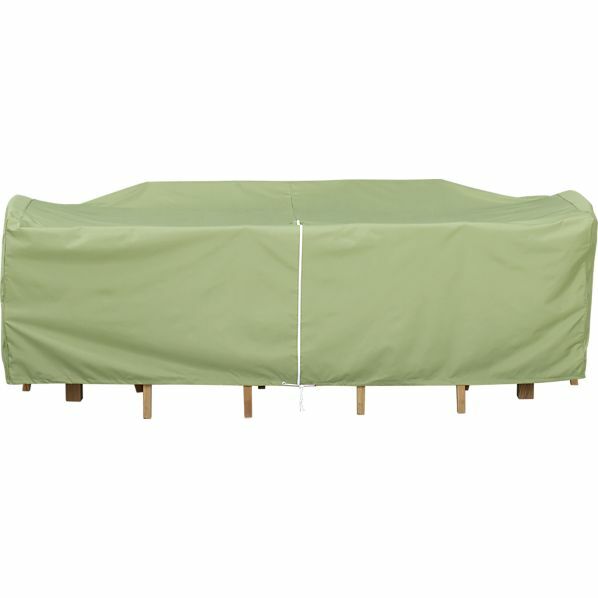 What We Did: I found these durable furniture covers from Crate & Barrel (pictured below). I bought the small rectangular table cover, along with the matching cushion bags, chaise lounge cover and umbrella cover for $140.00 before tax. Furniture covers can be found for less but since I bought my outdoor furniture from Crate and Barrel, I opted to buy ones that I knew would fit. If furniture covers aren’t in your budget, and you have the space available, move your furniture to the garage or basement. Step 3: Chim chim-in-ey, chim chim-in-ey Chim chim cher-ee! Schedule a chimney sweep to evaluate your fireplace. How: The National Fire Protection Association says that chimneys, fireplaces, and vents should be inspected at least once a year. Ask friends and neighbors if they can recommend a service or check Angie’s List for a list of reliable and qualified businesses. I searched the National Chimney Sweep Guild website for local companies and found Century Chimney Sweep. The Chimney Safety Institute of America has more information about cleaning standards. What We Did: Our chimney hasn’t been cleaned since we’ve lived here (over 2 years now) so it’s fair to say that we’re due for one. Total cost was estimated to be about $100.00 which includes a thorough cleaning and inspection. Step 4: Speaking of a warm, crackling fire…it’s time to prepare and protect your firewood. How: Purchase or cut firewood to prepare it for storage. Stack all wood neatly so that it is easily accessible and cover the top 3 layers with a tarp or cover. The cover should protect the wood from getting wet but still allow for air flow. Make sure that the wood is off the ground (best if stacked in a store bought rack) to keep it dry and protect it from insects. What We Did: I always stack several split pieces of wood on the front porch for so that it’s near by and then cover remaining wood with a tarp to make sure that it stays dry.